RRB Recruitment 2018: Bumper Openings in Railway!!! ALP, Tech Vacancy Enhanced to 60,000 from 26,502. Through RRB Recruitment, Indian Railway wants to fill 60,000 more vacancies of Assistant Loco Pilot and Technician Grader 3. The Indian Railways is planning to increase Group C Posts for Assistant Loco Pilot (ALP) and technicians from 26,502 vacancies to 60,000. In official notice, the Railway Recruitment Board has said that post wise details of enhanced vacancies will be advised on the official websites of RRBs in due course. So, visit RRBs website regularly for latest updates. RRB ALP, Tech Vacancy Increased From 26,502 to 60,000 !!! Railway Recruitment Board is going to fill 60,000 more vacancies of ALP/ Technician. According to qualification, candidates can apply for RRB Jobs. Railway has launched a drive to improve performance of organization and increase morale of sincere and diligent employees. For more details regarding RRB Recruitment 2018-19, you need to go through the below section of this page which is well provided by team of www.privatejobshub.in. Have a look below for RRB Vacancies!!! 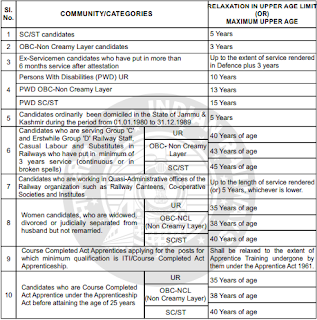 Here we have presented all the job advertisement released by RRB as there are numerous of notification that are being announced by Railway Recruitment Board for filling up various jobs according to the regions. So we have provided here links for all active RRB recruitments 2018, candidates just need to hit the link to get details of RRB Region Wise Recruitment. Combination of various streams of these Engineering disciplines from a recognized Institution in lieu of ITI. Matriculation / SSLC plus ITI from recognized institutions of NCVT/SCVT in the relevant trade (OR) Matriculation / SSLC plus Course Completed Act Apprenticeship in the trade for which you are going to apply. For RRB Assistant Loco Pilot Recruitment and RRB Technician Grade III Recruitment, selection of applied candidates will be done on the basis of various rounds that are discussed below. You can follow the pattern and score good marks to get final recruitment in RRB. The Second Stage CBT shall include two parts that are Part A and Part B and details pattern of exam is mentioned below. Have a look on that. Check Here: Do You Know These 11 Facts About Indian Railway? In RRB CBT part B of recruitment exam is qualifying in nature and shall have questions from the trade syllabus set by Director General of Employment & Training (DGET). Computer Based Aptitude Test will be conducted only for those candidates who have opted for RRB ALP Recruitment. The participants must score a minimum of 42 marks in each of the test batteries to qualify. For final selection, candidates will be called for Document Verification that will be conducted on predetermined date. So, prepare your all documents and carry them at the of verification. For आरआरबी भर्ती 2018, aspirants need to pay examination fee as per their category and detail of fee structure is mentioned below. So, you can have a look on it and make the payment through proper mode before last date. For the post of सहायक लोको पायलट and तकनीशियन ग्रेड III selected candidates will get attractive and satisfying amount of pay scale that is Rs 19,900/- along with additional benefits and allowances. How to Apply for Railway Recruitment Board Application Form? When you reach the home page of official website then aspirants are required to hit “Recruitment” tab presented in the menu bar. Once you hit the recruitment tab you will be navigated to the new page where you will see all RRB’s Zone links. Aspirants are then need to hit the appropriate zone link to, this will redirect you to the website of particular RRB Zone. Candidates will see numerous of links related to RRB Recruitment Notification but you are required to hit the suitable link. The notification for the concerned post will open with all the details about vacancy and its requirement. Candidates are suggested to go through the notification carefully before filling the application form for Railway Recruitment Board Latest Jobs. Once you found yourself eligible for the concerned post then hit the suitable link to apply online. Then aspirants have to fill RRB Online Application Form with complete and proper details and recheck it to avoid any mistake. If the payment of application fee is to be made then candidates are required to pay the fee through the online mode by using Debit Card/ Credit Card/ Net Banking etc. The next step for the applicants is to upload required documents such as caste certificate, disability certificate, and digital images of signature, photograph etc in prescribed size. Then take a preview of all the details give and after that press on “Submit” button. At last take a print out of your filled application form for future use. RRB issues Railway Recruitment Board Call Letter for the aspirants who are all set to appear in RRB 2018 Recruitment. Participants of exam may get their RRB Admit Card 2018 for upcoming events through this page. Candidates may go through links given below on the basis of appropriate zone for RRB Recruitment. Candidates who Railway Recruitment Board Selection Process participates in might be eager to get the RRB Results after successful completion of exam. They are informed to get their RRB ALP Technician Result when it is announced; you are just required to hit appropriate link for RRB Result 2018. For more information about RRB Recruitment 2018-19, candidates are required to visit the Official Website. Join us on Facebook or Google + to get latest and instant updates of 2018.